Is the need to over-apologize really more a female thing? And regardless of who does it more, why are we doing it? Maja Jovanovic, Ph.D., sociology professor at McMaster University in Ontario, Canada and author of “Hey Ladies, Stop Apologizing and Other Career Mistakes Women Make,” says women do, in fact, have a tendency to apologize more and do it for different reasons than men. “We know intuitively that women apologize more than men, but now we actually have the research to back it up,” says Jovanovic, referring to a University of Waterloo, Canada study that found that women likely tend to apologize more often because they have a lower threshold than men for what they consider offensive. “If men deem an infraction egregious enough, they apologize. The problem is they find very few infractions deserving of an apology, and women are apologizing for just about everything,” she says. This seems to fall in line with Crosley’s line of thinking. Like Crosley, Jovanovic attributes a woman’s tendency to apologize to being “socialized into a passive mindset” and “people pleasing behavior” from an early age. “Apologies have become our de-facto way of communicating, a way of filling the silence and keeping the peace when interacting with others,” she says. She also attributes a fear (the driver of anxiety, mind you) of not being liked and being seen as offensive, to excessive apologies. “We preempt what we think people are thinking about us with an apology as if to say, ‘I already know what you’re thinking … and I’m sorry,’” she explains. 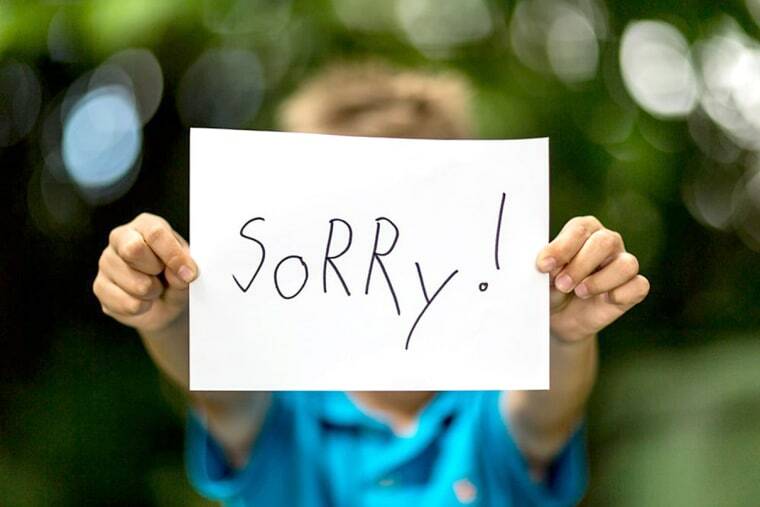 Apologizing when we have done something wrong is a real strength, but compulsive apologizing presents as a weakness at work and in personal relationships. Without assigning gender, Tara Swart, neuroscientist, medical doctor, leadership coach and author of the upcoming book “The Source: Change your mind, change your life” says serial apologists mostly do so out of habit, possibly stemming from a childhood where one was made to feel wrong or fearful of punishment (and thus, perhaps anxious). “It may be that the normal human need to belong has been compromised, creating a shame response that’s meant to induce forgiveness and reacceptance,” she explains. “Apologizing when we have done something wrong is a real strength, but compulsive apologizing presents as a weakness at work and in personal relationships,” Swart says. In this vein, Swart says both giving and receiving apologies can sometimes elicit what she describes as “survival emotions,” such as fear, anger, disgust, shame or sadness, which pump the stress hormone cortisol into our brains. Whatever your reason for developing this habit, like with any habit, you can nip it in the bud with a little effort. There’s even a plug-in for that; Jovanovic recommends a Google Chrome plug-in called “Just Not Sorry” to alert you to words that undermine your message in emails. Adults need recess, too. Here's why you should make more time to play.